For New Year’s Day, my in-laws treated my husband, me, my sister-in-law, and her boyfriend to a dinner at the lovely Table 45. This “recipe” is inspired by the amazingly delicious meal that I had there. It’s on the appetizer menu, but was more than enough for me! The end result isn’t particularly beautiful, but it was delicious! Unfortunately, I neglected to take a picture of the lovely food. I ended up changing so much that it really doesn’t bear much resemblance to Table 45’s. Instead, the taste is a little closer to CPK’s Thai Chicken Pizza or MacKenzie River Pizza’s Thai Pie. The beauty of this “recipe” is you can really do whatever you want with it, which I suppose is true of any pizza recipe. Swap the sauce, switch the veggies, add chicken, change the cheese, add seasoning, etc. I don’t have amounts here, sorry. Really depends on how much you are looking to make. 1 package/bottle of each should do you. 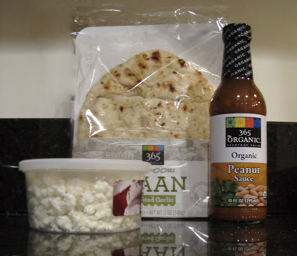 I ended up with more ingredients than I needed for my 4 naan. I didn’t have cilantro in mind initially, which is why it’s not on the main photo. But I had it handy from another recipe, and it really “made” the pizza. If you aren’t one of those odd cilantro-haters, I would highly recommend it. These were the perfect size for a toaster-oven, so I didn’t have to heat up my entire oven just for one pizza. Chop onions into whatever size you prefer. They should be fairly even so they cook at the same rate. Clean mushrooms, tear or slice into smaller pieces if preferred. Spray a small amount of oil onto a pan. Add the onions, and cook on medium-high for 3-5 minutes. Stir regularly. If you see some delicious brown bits getting stuck to the pan, deglaze the pan by adding a small amount of liquid (wine, water, or broth – I used water in this case) to the pan and scrape the bits up with your spatula. 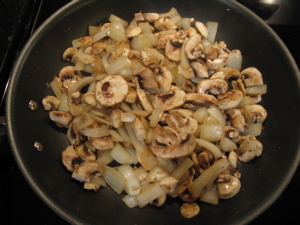 Once onions are starting to brown, add the mushrooms. When both onions and mushrooms look/smell/taste done, remove pan from heat. Spread the peanut sauce thinly over a piece of naan. Add the mushrooms and onions. Top with the goat cheese. 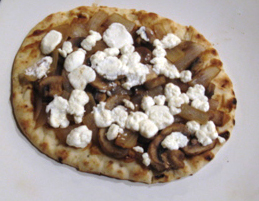 Remove from oven, and smash the goat cheese down lightly so it more evenly covers the pizza. This entry was posted in Main course, Recipe.